Last week, I posted my testimony on the proposed changes to Colorado's campaign finance rules. But based on the discussion at the hearing, I realized that I was wrong on certain points. So on Tuesday, I revised and re-submitted that testimony. That's below. You can find all of the testimony submitted so far on the Secretary of State's website. I plan to blog some of the better testimony over the next few weeks. My testimony is also available as a PDF. My name is Diana Hsieh. I'm a philosopher by trade, writing and speaking on the application of philosophy to the challenges of everyday life. I'm not particularly active in politics, except on the issue of abortion rights. In 2008 and 2010, I worked with Ari Armstrong against the proposed "personhood" amendments to our state constitution. We didn't just want to see these measures defeated: we wanted to explain and defend our view of the proper basis of abortion rights. The "personhood" ballot measures were a prime opportunity for us to do that. Unfortunately, our efforts were seriously hampered by Colorado's onerous and intrusive campaign finance laws. The same will happen in the upcoming 2012 election, despite the proposed rule changes. As a citizen activist, that's extremely frustrating and disheartening. Nonetheless, I support most of the proposed rule changes as an important step in the right direction. They clarify the demands on people who choose to speak about Colorado elections, and they limit the legal risks of doing so. Activists like myself still won't have anything close to free speech, but we'll have slightly freer speech. In 2008, Ari Armstrong and I wrote a policy paper against Amendment 48, the proposed "personhood" amendment to Colorado's constitution. I published it under the auspices of the "Coalition for Secular Government," which was then and still is now, little more than me and a blog. Ari and I wrote the paper without compensation, and I spent a few hundred dollars of my own money to promote it. Only by happenstance, I learned that I was obliged to file campaign finance reports. With my first non-zero report, the hassle of typing in the names and addresses of Office Max, The UPS Store, and the Post Office (where I spent just under $200 in total on office supplies, photocopies, and stamps to distribute the paper) convinced me that to spend any money to promote our paper was too much trouble. I felt that chilling effect on my speech very keenly. In 2010, Ari Armstrong and I revised and expanded our paper to oppose Amendment 62, the next "personhood" amendment on the ballot. This time, the work was funded by generous donors, in the form of 63 pledges ranging from $4 to $300 for a total of $2795. These people, most of whom I knew personally, wanted Ari and me to speak for them, to explain and defend our common view of abortion rights, and we were eager to do that. When I reviewed the campaign finance regulations, I was appalled to discover that I was required to report the name and address of any contributor giving $20 or more, plus the occupation and employer for any donation over $100. Why was I so upset? First, the process of compiling and filing the reports was extremely burdensome, eating away hours that I could have spent opposing Amendment 62. Second, my contributors were entitled to privacy, particularly on a controversial topic like abortion. Third, I feared that even a trivial error in a report could result in massive fines, plus attorney fees to defend myself. The little money that I'd reserved to promote the paper, plus my own payment for writing the paper, would quickly vanish: I'd be forced to sacrifice my personal savings just to exercise my right to free speech. Ultimately, the result was basically the same as in 2008: I was unwilling undergo the troubles and risks of filing more reports, and so I opted not to raise any funds for our work beyond those 63 pledges. Again, I felt the chilling effect of these campaign finance laws. Based on these experiences, I know that Colorado's campaign finance laws constitute a major violation of free speech rights. First and foremost, free speech means that people are entitled to express and advocate their ideas without forcible inference from the government or anyone else. Second, free speech means that people are entitled to join together in their speech: they have a right to pool their resources and their talents so as to more effectively express and advocate shared values and ideas. Third, free speech means that people are entitled to say as much or as little as they please, including speaking (or funding others' speech) anonymously. Here in Colorado, we do not have free speech in elections. We the people cannot join together to express our views on upcoming elections--not unless we register with the government and submit regular reports disclosing our identities and minute details of our finances. Any failure to do so--even if only some trivial error--can result in being dragged to court by our political opponents and then being forced to pay hundreds if not thousands of dollars in fines. In essence, we speak about elections not by right, but by government permission. Moreover, to obtain that government permission to speak on elections, people must be willing and able to navigate a labyrinth of red tape and paperwork. They must be willing and able to pay thousands of dollars in attorney fees and fines. Progressive activists and politicians demand even more "transparency" (i.e. more burdensome and intrusive disclosures) and more "accountability" (i.e. more hefty fines for errors). They know that the current rules stifle speech--particularly the speech of small groups with little money. Their lack of concern for this repression of citizen activists reveals that their goal is not a more informed electorate. Instead, these progressives seek to expand their own political power by any means, including forcibly silencing their opponents. That's disgraceful. Free speech requires nothing less than repealing or overturning all of Colorado's campaign finance laws. In the meantime, however, the campaign finance rules can be made less confusing, less onerous, and less risky. For the most part, the proposed rule changes are a huge step in that direction, and that's why I support them. Here, I'd like to discuss four proposed changes: (1) the definition of an issue committee, (2) privacy for contributors worried about safety, (3) penalties and waivers, and (4) aggregating contributions and expenditures. As I understand the current rules, any group of two or more persons qualifies as an "issue committee" if the group (a) works for or against a ballot measure as a "major purpose" and (b) spends or receives more than $200. Proposed Rule 4.1 affirms that the $200 reporting threshold is raised to $5000, although litigation is pending. I support that change: small groups with limited resources should be able to advocate for or against ballot measures without incurring the onerous burden of registering, opening a new bank account, and then reporting their finances. As I said in the May hearing, however, I'd like the reporting threshold to be raised even higher, at least to $10,000. Proposed Rule 1.12.3 defines a "major purpose" as meaning that more than 30% of the group's spending concerns a ballot measure. That test seems reasonable in the abstract, yet in practice, that would disproportionately burden small activist groups. Instead, I propose that the $5000 reporting threshold should be used for the "major purpose" test too: if a group spends $5000 or more on a ballot measure, then they should be required to report as an issue committee, whether that spending constitutes 5% or 95% of their total spending. Mostly, however, the campaign finance rules should clearly identify which groups qualify as issue committees, so that people can know whether they're obliged to report or not. Under the current rules, where "major purpose" is left undefined, groups doing any work related to ballot measures must file purely as a defensive tactic. However, I'm doubtful that any bright line test for "major purpose" could be applied to my own ever-expanding work against the "personhood" movement. In the 2012 election season, the Coalition for Secular Government won't be narrowly focused on defeating Colorado's likely "personhood" amendment: we plan to work against "personhood" measures on the ballot in other states, as well as against the "personhood" movement and for abortion rights more broadly. Any attempt to estimate what spending concerned Colorado's ballot measure would be arbitrary. Hence, I'll have to register and file reports as an issue committee, even if only as self-defense. I don't see any way to apply the "major purpose" criterion objectively in a case like ours, where work on the ballot measure is part and parcel of a much larger and broader advocacy effort. Nonetheless, I support a clarification of this rule. The current language can be interpreted any which way, and the proposed definition of a "major purpose" would clarify the criterion for many groups. The current rules permit people who fear for their own or their family's safety due to information disclosed on any campaign finance report to request that such information be redacted. Proposed Rule 20 would extend the protection offered to redacted information: it would not be "subject to disclosure under the Colorado Open Records Act." That's good, but I would suggest instituting a well-defined and speedy process for redacting such information, so that sensitive information is not ever released on the web. Otherwise, the protection is basically worthless, and people who fear for their safety will not donate to political causes. I would suggest that the group filing the report should be able to flag certain records as private, and those records would not be published unless the application for privacy from the contributor (perhaps required to be submitted at the same time as the report, or within a few days thereof) was denied by the Secretary of State's office. Moreover, if possible, I would recommend allowing the redaction of information for more reasons than just "safety." People have a variety of perfectly valid reasons for wishing to contribute to causes anonymously, such as wishing to avoid unpleasant conflicts with co-workers, clients, or neighbors over politics. A person with unpopular opinions should not be forced by law to risk ostracism or unemployment to support a political cause. More broadly, a person should have the right to speak anonymously, and, by extension, the right to enable others to speak for him while remaining anonymous. That's not possible under Colorado's campaign finance laws, and it's just another way that they violate free speech rights. Under the current rules, failures to comply with the campaign finance rules can incur fines of up to $50 per day per violation, without limit. Fines have often grown far beyond a group's ability to pay. According to the 2010 manual, the Secretary of State's office grants waivers and reductions of fines at their discretion using the vague "good cause" standard. That makes the process ripe for abuse, including partisan favoritism and other forms of bias. In addition, fines for campaign finance violations are used to silence speech. Groups (usually on the left) can and do sue over minor errors in order to drain the resources of political opponents (usually on the right) by forcing them to spend limited funds on fines and attorney fees rather than advocacy. That's not just dirty politics: it's a violation of the free speech rights of the people who contributed those funds. As far as I understand, proposed Rule 18 would establish clear standards for penalties and waivers. Waivers would be granted for specified good causes, penalties would start small then increase with successive offenses, penalties would be limited based on the resources of the group, and mistakes would be penalized far less than willful failures to comply. Also, total penalties would be limited to $50 per day per report for 180 days, i.e. $9000 per report. These changes are hugely important, in my opinion. The possibility of incurring hundreds if not thousands of dollars in fines for failing to comply with wildly confusing campaign finance rules should terrify any sane person. More than anything else, the current possibility of ridiculously large fines, totally disconnected from any intentional wrongdoing and out of proportion to the group's ability to pay, silences political speech in Colorado. The current rules, in fact, make election speech into a privilege of the wealthy, for only they can afford to pay the current fines. That's terribly unjust: the poor should have just as much right to speak as the rich. That's why I'd recommend limiting the fines even further to at most $1000 per report. I'd rather see a thousand well-funded groups pay fines for campaign finance violations as "cost of doing business" than silence one ordinary citizen activist. By the current rules, contributions of $20 or more must be itemized on reports, including the name and address of the contributor. The rules don't say any more than that, and hence, a person can give multiple donations of less than $20, and those donations are never itemized. The same applies to expenditures. Rule 10.1 changes that policy: if contributions from a given source for a given reporting period total $20 or more, then they must be aggregated and itemized on the report, even if each individual contribution is less than $20. (The same does not apply to the $100 threshold for occupation and employer, however.) Rule 10.2 does the same for expenditures: for each reporting period, expenditures to the same source must be aggregated, then itemized if over $20. I'm partly sympathetic to the goal of this rule change. The current rules are unclear, and to allow many donations under $20 from the same source without itemization seems like a "loophole" that should be closed. However, to close this "loophole" entails dramatically increasing the burdens imposed on issue committees, such as myself. How so? Under the current rules, I need only collect personal data about a contributor if he contributes $20 or more. That's a ridiculously low threshold, but at least it's a bright line for data collection. Under the new rule, however, I'd have to collect personal data from every contributor, even from someone who just gives me a $1 bill. Why? That person might give me twenty such bills over the course of the reporting period, and in case that happens, I need to identify all donations from that person in my records, add them up for the reporting period, and then itemize them in my report if they total $20 or more. At that point, I might as well just itemize every contribution (and every expenditure too), whatever the amount, just to be safe. The burden of complying with this rule change would be enormous for many groups, particularly those of us who rely on small donations. Oddly, the rule change would encourage groups not to accept donations smaller than $20, simply for the sake of clarity in disclosure requirements, which would effectively silence people unable or unwilling to donate so much. Moreover, contributors would be burdened too, as they'd be obliged to give their name and address with every contribution. Also, the names and addresses of donors giving less than $20 would likely become part of the public record in any lawsuit. In effect, this rule change would make small anonymous contributions impossible, and that might deter many people from contributing any dollar amount. Finally, the unscrupulous political opponents of an issue committee could easily abuse this new rule. A person could make a few small contributions to an opponent over the course of a reporting period, some in cash or otherwise anonymously, in the hope of entrapping the group in a campaign finance violation. And then, if his name and address wasn't listed on the report, he could sue. Also, proposed Rule 10.1.2 says that any contribution from an LLC must be itemized, whatever the amount. According to the 2010 manual, that's not currently required for issue committees, but only for political committees. Extending the rule to issue committees would impose a serious burden. In my own case, I'd have to inquire with every contributor to ensure that the funds are not from an LLC, for if so, I'd have to somehow flag that contribution in my records to remind myself to itemize it on the report. For me, simply refusing contributions from LLCs might be easier. If so, the rule would have the effect of stifling the speech of people who choose to organize themselves in a corporate form. For these reasons, I strongly oppose these rule changes on contributions and expenditures. The new rules seems easy, simple, and fair in the abstract. Yet in practice, they would impose a major burden on issue committees and become fodder for partisan abuse. I urge the Secretary of State to reconsider these changes. In summary, I support most of the proposed changes to Colorado's campaign finance rules. The changes would make the rules less confusing, less onerous, and less risky. That's good for free speech and good for fair elections. However, our ultimate goal must be fully free speech in Colorado's elections--and that requires the elimination of all campaign finance laws. Mandatory disclosures do not make elections "transparent," and hefty fines do not make groups "accountable." Disclosures and their associated penalties only silence people, particularly ordinary citizens seeking to speak their minds. The following testimony was submitted for the May 3, 2011 hearing concerning raising the reporting threshold for issue committees. At the time, I didn't imagine that these activities would be subject to any campaign regulations. After all, I was just exercising my right to speak freely on an issue that I cared deeply about -- or so I thought. However, just to be sure, I checked the web site of Colorado's Secretary of State. I found nothing relevant to my activities, so I thought I was in the clear. More importantly, I was appalled that my home state forbade me from speaking freely on an ballot issue that I cared deeply about -- even just to spend a few hundred dollars of my own money promoting a paper that I wrote with a friend. Even worse, I could be subject to hefty fines for failing to comply with laws that I could neither find by diligent searching, nor understand by careful reading. In addition, I found complying with the regulations -- entering store names, addresses, and amounts for my few purchases of photocopies, envelopes, labels, and stamps -- to be so onerous that, after filing my first report, I swore that I'd not promote the paper in any way that required money thereafter. Hence, the burdens of complying with the law -- even just to spend a few hundred dollars -- were sufficient to silence me, in part. I was upset because such reporting violated the privacy of my contributors. As part of their right to free speech, people should be able to speak anonymously -- or fund the speech of others anonymously. These campaign finance regulations forbid that for any contribution of $20 or above, and that's wrong. Voters do not have a right to know the sources of funding for other people's political speech, any more than your neighbor has a right to know what you got for your birthday or what you buy at the bookstore. 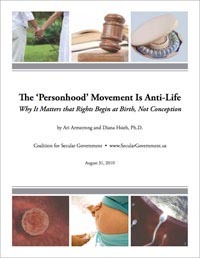 Consequently, Ari and I went forward with the project, revising and expanding the paper into a robust 43-page defense of abortion rights titled "The 'Personhood' Movement Is Anti-Life: Why It Matters that Rights Begin at Birth, Not Conception." I was -- and still am -- extremely proud of that paper. Yet the burden imposed on me by these campaign finance regulations was almost too heavy to bear. To comply with the law, I spent hours filling out and faxing paperwork to open bank and PayPal accounts for the Coalition for Secular Government. Then, once contributors began to pay their pledges, I had to compile and submit reports to the state every two weeks. Each report required a few hours of my time, and each was due a mere two to three business days after the close of the reporting period. To file the reports, I had to keep an extra set of books in an Excel spreadsheet, just so that I could track my contributions and expenditures in the format required for the reports. Of course, the reports for the state never quite matched my own records on the first try, so I'd have to double-check and triple-check every entry. I had to e-mail contributors for their addresses, and sometimes for places of work. Sometimes, finding the address of a business was a difficult chore: I was in a panic at 11:30 pm on the night that a report was due, desperately trying to find a physical address for Facebook. Even once I'd gathered all that information, the process of inputting it into the system -- typing in address after address -- was a major chore. To add insult to injury, I was petrified of making a mistake with every report I filed. Too much was unknown to me -- for example, the Facebook ads for the paper were paid for on my personal credit card, so should I report that as an expenditure when that credit card was billed, when it was paid, or when I reimbursed myself? When should I report contributions sent as checks -- when I picked them up from the post office or when I deposited them in my account? If a person wrote two checks for $19, would I have to report his name and address if I received and/or deposited them on the same day? I didn't know the answers to those questions, and I couldn't afford to consult a lawyer. I could only try to be careful -- and hope for the best. However, I forgot to file my first report for a few days, due to a mess of other pressing problems in my life from a backed up septic pipe in the house to scheduled travel to the east coast. In addition, I didn't have all the information that I needed for that report, including the addresses of many contributors. On realizing my error, I was in a state of dull panic for days, worrying that the $1000 I'd earned for writing the paper -- if not more from my personal funds -- would vanish in a puff of $50-per-violation-per-day fines. So I begged for a waiver. That was degrading, but I was desperate, particularly because I had no idea how some unknown state employee would judge my failure to file the report on time. Much to my relief, the waiver was granted some weeks later. In short, compliance with the campaign finance laws consumed hours of my life -- hours that I could have spent promoting the paper, writing op-eds, working on other projects, or even just watching a movie with my husband. With every dollar contributed or expended, I risked fines that I couldn't afford to pay. I was unable to speak as a matter of right, but rather only by government permission. I felt the pressure to just give in and give up -- to say nothing -- very keenly. First, the proposed threshold of $5000 in total expenditures and contributions is far too low. A grassroots group without any resources or employees -- such as the Coalition for Secular Government -- could easily exceed that amount in contributions or expenditures, just to expose a few thousand voters to its message. Second, the threshold will burden even groups who never e.xceed it Groups under the threshold will be obliged to monitor total contributions and expenditures on work related to ballot measures just to ensure that they're not obliged to report -- or risk huge fines. Fourth, once a group reaches the $5000 threshold, the reporting requirements are just as intrusive and onerous as they are now -- meaning far too intrusive and onerous. Every $20 contribution will have to be reported, as well every $20 purchase at Office Depot. That is not required by the Colorado constitution, and it ought to stop. Moreover, people attempting to speak out should not be subject to fines beyond their ability to pay -- as with the current system of $50 per day per violation. Instead, fines should be proportional to the actual expenditure or contribution -- and require deliberate fraud, not mere mistake or ignorance. With such changes to the campaign finance regulations, ordinary citizens in Colorado would be far more free to speak out on political issues than they are now. Under the present system, only large groups with millions of dollars -- armed with lawyers to advise them on the law and assistants to compile and file reports -- can afford to speak freely. The rest of us -- ordinary citizens like me -- are burdened and intimidated into silence. That flatly contradicts the stated purpose of campaign finance regulations in the Colorado constitution -- and the changes proposed by the Secretary of State would only perpetuate that wrong.